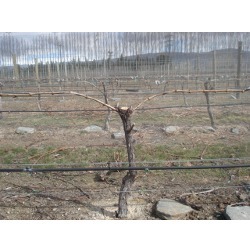 The pruning of the grapevines is generally carried out during the dormancy period of the plant. This is a very delicate phase in which the basis and the conditions of the new production are set, both for quality and quantity. It is a manual operation that requires care and attention because every past behaviour and future expectation of each plant need to be evaluated in order to plan the best action, considering the age of every different plant. Pruning greatly affects the physiology of the plant and the time of budding: the older plants are more resistant to intense cold and frost and they are characterized by late budding that can be anticipated by pruning. The pruning of the wood, carried out during the winter, must leave an adequate number of buds, while green pruning, carried out during the definitive change of colour of the grapes, thins out the bunches in excess in relation to the mass of leaves. A correct pruning will result in a balance between vegetative vigor and quantity and quality of yield, allowing a proper renewal of the vegetation.